Can’t decide which shirt to get? Let Facebook be the judge. 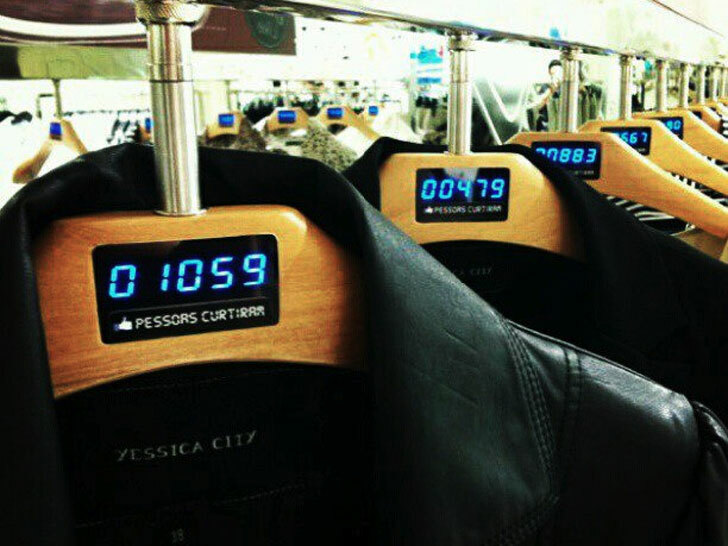 Earlier this month, C&A introduced a high-tech hanger that tallies the number of Facebook “likes” an item of clothing on its racks receives. Powered by the Brazilian retailer’s website, where visitors can give their favorite pieces the thumbs-up, the device features a built-in digital display that gauges a garment’s popularity—or lack thereof. The hanger is a marketing gimmick, to be sure, but it’s also a compelling way to crowdsource customer feedback in real time. Instead of soliciting a second opinion, shoppers can survey a larger sample of people. It’s shopping with a side of peer pressure. Welcome to the 21st century. Presented with an item’s approval ratings, however, shoppers face a different kind of quandary: do you buy something that’s universally beloved but isn’t as unique or would you prefer to stand out with a more divisive option? In other words, it’s shopping with a side of peer pressure. Welcome to the 21st century. Can't decide which shirt to get? Let Facebook be the judge. Earlier this month, C&A introduced a high-tech hanger that tallies the number of Facebook "likes" an item of clothing on its racks receives. Powered by the Brazilian retailer's website, where visitors can give their favorite pieces the thumbs-up, the device features a built-in digital display that gauges a garment's popularity�or lack thereof.